Here is an interesting article I came across while researching iPhones for the kids of the Broward Children’s Center…. Disclaimer — I do not now nor have I ever worked for Apple, and they haven’t paid me in goods or dollars for this post (although I’m open to negotiation). Last month, my twins turned 18. I’m still in deep denial over what is clearly a blip in the time-space continuum. I know for a fact that it was just a few days ago when we were huddled around their isolettes in the NICU, watching in awe as their tiny 24-week bodies struggled to survive. And now … well, I just can’t go there yet. We have been so blessed, so lucky. Their delays, while significant, were just that — delays. They are both fully-functioning, healthy, happy (adult?) human beings, enjoying their senior year in high school and starting to think about the future. My daughter has taken the wheel on her road to life and is well on her way to independence. Her brother, who has had more physical and learning issues, still has a way to go. For their 18th birthday, we got them each iPhones. During such difficult economic times, it’s reasonable to ask why would we spring for such a hot, trendy, extravagant gift as an iPhone. That, I can tell you in two words — assistive technology. short-term memory deficit — he would explain it to you, if only he could remember. Seriously, one of his teachers once told me: “He seemed to understand. He repeated it back to me exactly.” He does understand — he understands everything, he just can’t remember once the cue is gone. sequencing disorder — trouble breaking down tasks into reasonable chunks and completing them in the right order in a reasonable amount of time. I have long believed that my son was lucky to be born when he was — that technology would be his friend. I still believe that, but there have been some bumps along the way: an addiction to video games and losing three (count them, three) cell phones his freshman year. During the few days he managed to hold on to his cell phone, he never remembered to turn it on, so I couldn’t reach him any way. Then, last year, he used his birthday money to buy himself an iPod Nano. Miracle of miracles, he did not lose it. He kept it turned off during school, but remembered to turn it on after school so he could listen on his way home. About a month ago, we had a meeting with his assistive technology specialist at school. A long-time PC person, she recently got an iPhone and is tremendously excited about the potential it holds for many of her students. 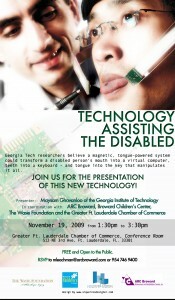 Assistive technology runs the gamut from wheelchairs to customized computers that allow quadriplegics to communicate with eye blinks. The field is exploding, but much of it is hugely expensive. While the initial outlay for the iPhone (about $200 for the middle-range iPhone) isn’t too bad, the $30 monthly bite per phone for the data package adds up fast. We learned, however, that unlike computer programs, iPhone apps are pretty inexpensive (often free), and there are new ones every day. While there are many PDAs out there, the iPhone offered some distinct advantages, first and foremost the fact that it would be my son’s new iPod, so we were pretty sure he would hold on to it. It’s fairly obvious how the calendar and organizational apps could help someone with short-term memory problems, but the iPhone apps offer much more than simple datebook functionality. For example, there’s an app called VoCal that allows my son to record a voice message on his phone, which then translates into a written calendar reminder. And it works! Our first iPhone success came after a missed orthodontist appointment one Friday. That night, he added the orthodontist’s phone number to his contacts and entered a voice reminder into his phone. That entry sent him an alert after school on Monday to call the orthodontist for a new appointment. My son gets out of school at 3:35. By the time I called him at 3:45, he had already made the new appointment and entered it onto the calendar, which automatically sent an email to me so I could put it on the family calendar. That may sound like a small thing, but it was one giant leap toward independence for him and peace of mind for me. That ability to recognize voice commands is a huge advantage for a kid with graphomotor issues. The sensitive microphone allows him to use his voice in a variety of ways, bypassing the need to write (and even draw). For example, there is an app called Omni Note. Say his horticulture teacher draws a picture of a plant cell on the board and tells the class to copy it for a quiz on Monday. This would be extremely difficult for my son to do, and the end result would not look anything like the original. With the Omni Note app on the iPhone, my son could take a picture of the diagram, draw directly on that picture, add a typed and/or voice message to the picture and send it immediately to his computer at home so he could study it over the weekend. How cool is that? His teachers are also on board, allowing him to keep his iPhone out and on throughout the day. He doesn’t text and we haven’t given out his phone number, so there is no risk of interruption during class. As part of his sequencing disorder, he has trouble organizing his thoughts into a coherent structure in school papers. One of his English teachers had the brilliant idea of having him research new apps and, as an assignment for class, write out the directions on how to use it (a great sequencing and organizational exercise), and include a paragraph or two about how he, personally, is using the app (a good way to practice his analytical skills). Right now, our district would have provided him with an iPod Touch, which has some, but not nearly all the functions of the iPhone. The integrated microphone of the iPhone is a big part of the functionality my son needs to make this tool work for him, so we opted to make a family investment. I understand that this is new technology, which is often scary and expensive for schools to contemplate, but I urge educators to jump on this bandwagon early. The potential of the iPhone for special needs students is vast and untapped, and this generation of students is already immersed in technology. This seems to me to represent the best that technology has to offer — a chance for students to overcome (even bypass) their disabilities and get right to the good stuff — the learning. How did we justify making the same investment for our daughter? We told her it was because it would be a good tool for her at college next year, and it will be, but really, this is just one of those times when she should be darn grateful for her twin brother. via Chicago Moms Blog: iPhones — New Help for Special Needs Kids. Sparked by Twitter, Facebook and FriendFeed, the real-time trend has been to the latter part of 2009 what “Web 2.0″ was to 2007. The term represents the growing demand for immediacy in our interactions. Immediacy is compelling, engaging, highly addictive … it’s a sense of living in the now. via 10 Web trends to watch in 2010 – CNN.com. Join us tomorrow, November 19th 2009 from 1:30pm to 3:30pm EST at the Greater Ft. Lauderdale Chamber of Commerce conference room for a FREE presentation on this awesome technology. Georgia Tech researchers believe a magnetic, tongue-powered system could transform a disabled person’s mouth into a virtual computer, teeth into a keyboard – and tongue into the key that manipulates it all! Presented by Maysam Ghovanloo of the Georgia Institute of Technology in coordination with ARC Broward, Broward Children’s Center, The Wasie Foundation and the Greater Ft. Lauderdale Chamber of Commerce. Remember, this event is FREE and open to the public. If you do plan on attending the event at the Chamber office, please RSVP to mleachman@arcbroward.com or by calling 954-746-9400. Here is an interesting product I found being used by the Ann Storck Center It is a Flash based slide show gallery. The Ann Storck Center is using it to display newspaper clippings. The bad part of this is that these articles can not be indexed by the search engines this way. However, it is a great, inexpensive little tool for your website if you are on a budget. Worth checking out if you are looking for a photo gallery component for your website! I look forward to keeping you informed about technology I run across for non-profits, medical facilities and general information for IT professionals. Don’t hesitate to ask questions or suggest items of related interest!